From its earliest decades, Federation supported a Jewish Education function in many of its affiliated agencies. By the 1970s under Joseph Harris, who held positions of increasing responsibility working with Federation’s affiliated Community Centers, Camps and other group activities, Jewish Education became a component of selected programs at each of these institutions. Joseph Harris remained at Federation through the merger with UJA in 1986. His files end in 1987 when he was Executive Director of Group Services and Jewish Education at UJA-Federation of New York. In going through his last (large – over 50 boxes) group of files, some documents have surfaced that explain some of the major components of Jewish Education work at Federation and UJA-Federation. There is also an explanation of the financial support given “to the field” through the Fund for Jewish Education, and other funding sources such as the endowment funds established at UJA-Federation “through the generosity of Joseph S. and Caroline Gruss”. Other documentation gives more detail on some of these funds. 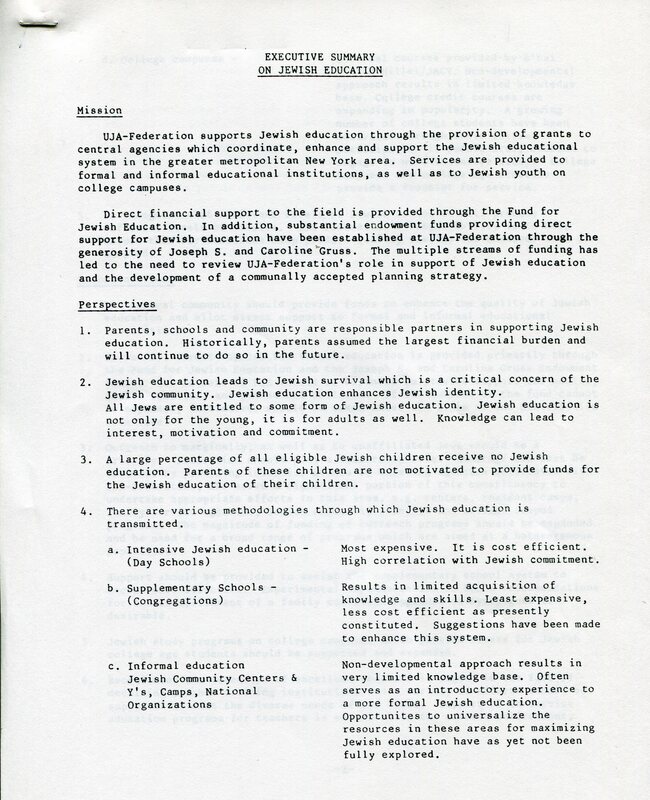 A 1986 document, “Guidelines for the Administration of the Caroline and Joseph S. Gruss Life Monument Interest Free Loan Fund” explains that this fund was established “to provide major interest free loans for Jewish educational institutions that will enable them to expand their facilities”. The Hebrew Free Loan Society, “a member agency of Federation, will administer the disbursement … of loan money from the Fund”. The Bureau of Jewish Education was created in 1910 “to upgrade Jewish education, to introduce modern texts and teaching materials, graded curriculum, appropriate pedagogic methods, improved preparation and remuneration of teachers, and better supervision and administration of schools.” In 1939 the Jewish Education Committee (JEC) was formed by a merger of the Bureau and the Association of Jewish Education. 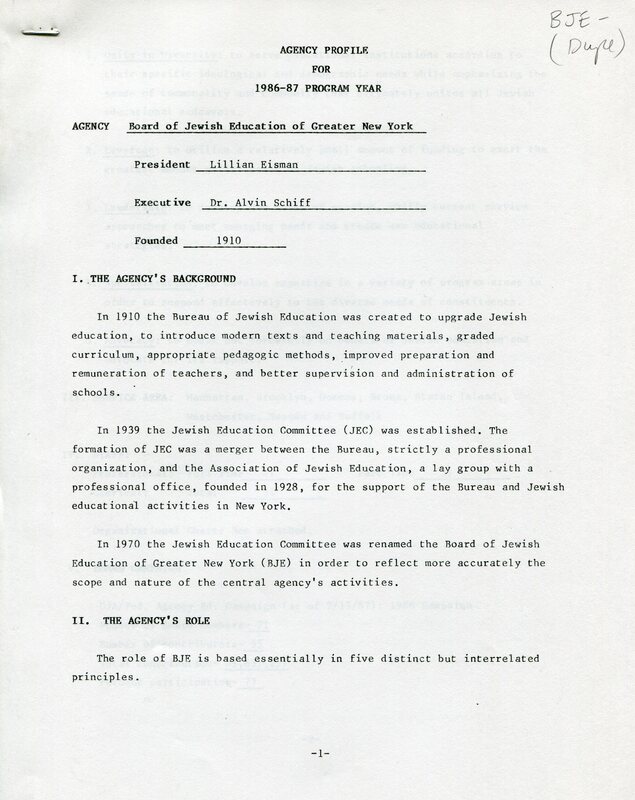 In 1970 the JEC was renamed the Board of Jewish Education of Greater New York. Through these funding sources and the careful allocation of funds, Federation and UJA-Federation’s Jewish Education mission brought tangible results. 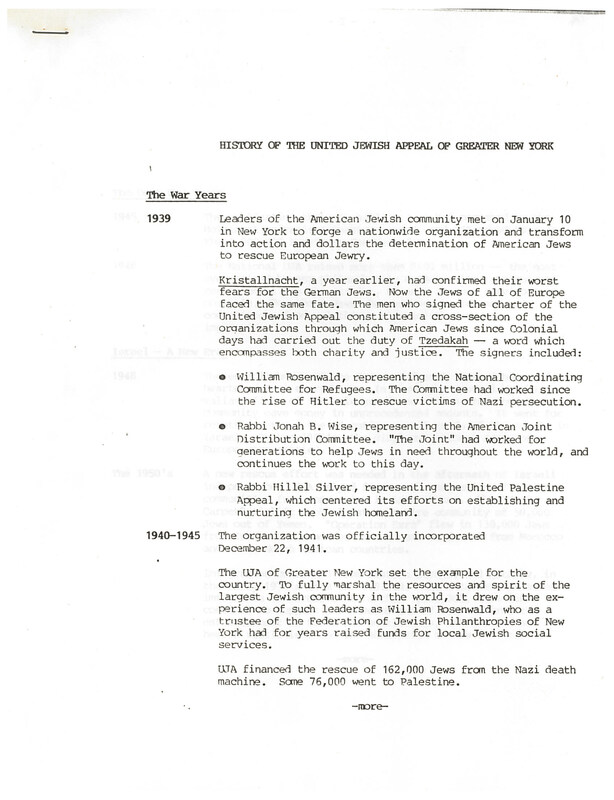 As part of our ongoing efforts to disseminate information about UJA-Federation using a variety of methods, we have been collecting significant dates in the history of United Jewish Appeal of Greater New York and the Federation of Jewish Philanthropies of New York to create a timeline of events. We hope to organize all of the event-related information to create an online exhibit and/or a component of a website related to the processing project. We are working to capture a mix of information related to the affiliated agencies, the staff and leadership of the philanthropic organizations (before and after the merger), and relevant historical events. It was fortunate, then, that in processing the folders of Rabbi David Cohen, Federation’s Director of Public and Community Affairs in 1986, I encountered a folder titled “Merger” with some of the most significant dates in the history of the two philanthropic organizations. 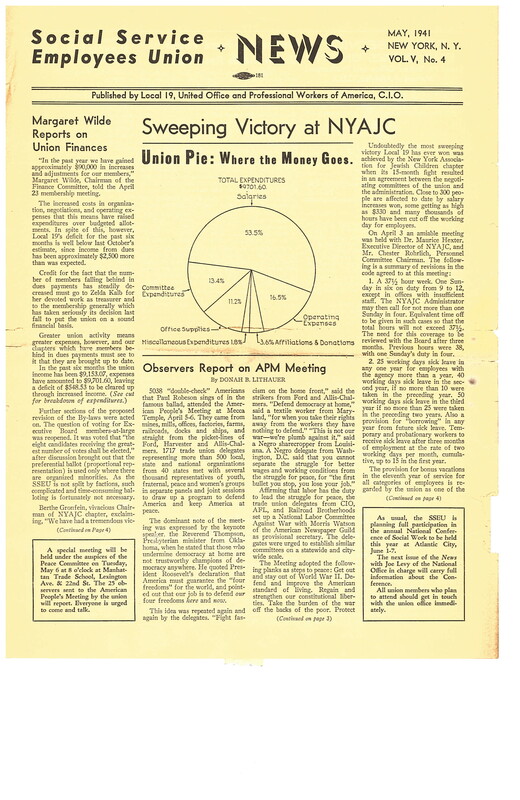 The folder of material was likely used to educate the soon-to-be-merged lay leadership and staff about the two organizations, including their respective histories. The dates and events cited in the two documents are being used to further enhance our own timeline. If you, kind and gentle blog reader, have any significant dates that you would like to contribute to our project timeline, please use the link “Leave a Comment” found below. We recently brought in 54 boxes that were labeled as files from Dr. Donald Feldstein’s office as Director of the Community Services department of FJP in the 1970s and 1980s. Two boxes, however, were much older. One box contained agency budget and subject files, 1927-1941, belonging to Executive Vice-President (EVP) Dr. Solomon Lowenstein, and the second box contained agency budget and subject files, 1938-1941, belonging to Dr. Maurice Hexter, then Assistant EVP to Dr. Lowenstein. Longtime readers of this blog may remember that many of Hexter’s files were processed in 2011-2012, and that he and Joseph Willen served as co-EVPs for 25 years (1942-1967). Hexter’s subject files in this new box included two thick folders labeled, “Personnel Practices”, and covered more than a year, 1940-1941, when negotiating with the union that represented employees of Federation child care agencies, primarily the New York Association for Jewish Children. 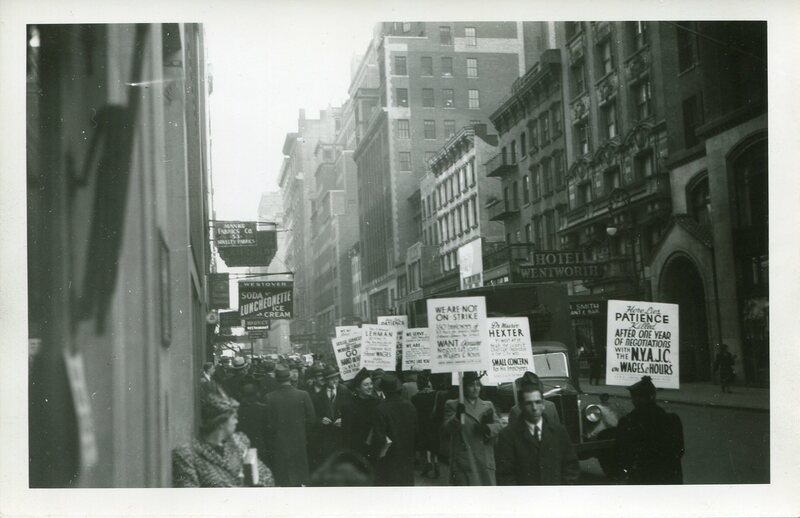 From 1940 to 1941 Federation and some of its agencies were embroiled in negotiations with child care workers over salaries, number of hours in a work week, and other personnel issues. According to a March 7, 1941 letter to “Friends” from Evelyn Adler, President of the Social Service Employees’ Union (SSEU), Local 19, the situation involved the “welfare of 400 employees of the New York Association for Jewish Children (NYAJC). That situation has grown out of the merger which brought that organization into being in January 1940 — the combining of the Hebrew Orphan Asylum, the Hebrew Sheltering Guardian Society, the Jewish Children’s Clearing Bureau, and the Fellowship House, Inc. It sounds like one of the biggest improvements for the workers after the strike was the decrease in the number of hours in their workweek, which was an important detail in the negotiations.